I love how throw pillows can liven up a room. You can really create a mood based on what kind of accent pillows you have. Do you want to create a calm, casual lounge space? Or a cozy reading nook? Or a swanky ensemble fit for HGTV? You can do all these things just by adding a few throw pillows! I love that they can be swapped out on a whim, whether by season or mood. You can buy a plain pillow form from a craft store, and jazz it up with interchangeable covers, or if you’re not great with a needle and thread (or simply don’t have the time!) you can snag some purdy pillows for under $20 each! Here’s a few of my faves that are totally affordable! These are the perfect way to jazz up a room on a budget. You can really make a statement without spending a lot of money, plus it makes sense to buy your room staples (furniture, carpet, etc) in neutrals, and accessorize with pops of color so you can afford to change them out from time to time. 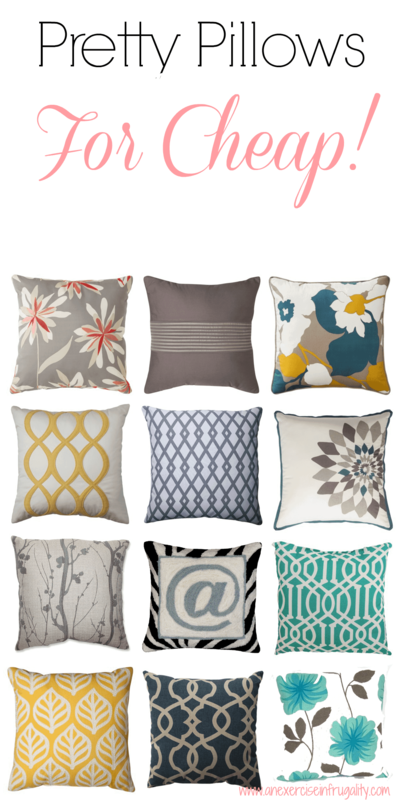 Now the fun part comes in- deciding which throw pillows are your favorites! Personally, I think the Paolo is my favorite. Which one’s yours?